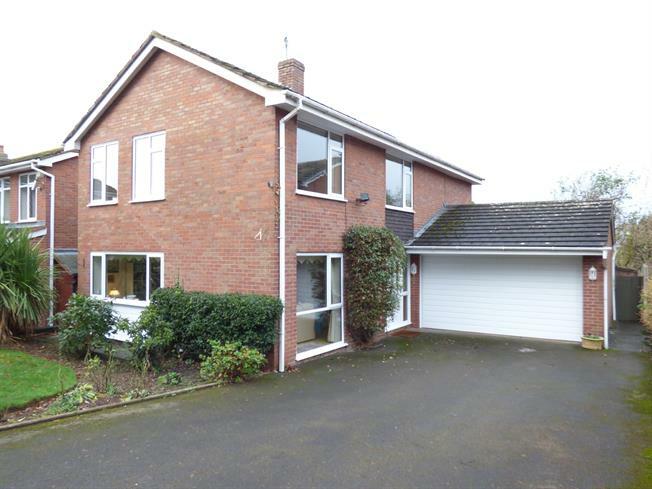 4 Bedroom Detached House For Sale in Stafford for Offers Over £335,000. An opportunity not to be missed! This superb four bedroom detached family home in the desirable village of Acton Trussell, offers spacious accommodation comprising entrance hall, lounge, dining room, conservatory, kitchen, utility room and guest WC. To the first floor there is a master bedroom with en-suite shower room, three further bedrooms and a family bathroom. To the front there is a lawned garden with good sized driveway providing ample off road parking which leads to the garage. To the rear there is a paved patio and lawned garden. Having front door with windows to either side, radiator, cloaks storage cupboard, radiator and stairs to the first floor. Having a range of wall and base units with work surfaces over incorporating a one and half bowl draining sink unit with tiled splashbacks, built-in double oven, electric hob and space for appliances. Windows to rear and side and tiled flooring. Having wall and base units with work surfaces over and space for appliances below. Double glazed window and door to the side. Having double glazed window to front and side, fireplace with marble effect back, radiator and coving. Having sliding patio door leading to the conservatory, radiator and coving. Of Upvc construction with door out onto patio area and tiled flooring. Having low level WC, pedestal wash hand basin, tiled walls and flooring, radiator and double glazed window to side. Having double glazed window to the side, radiator and airing cupboard. Having double glazed window to the rear, two built-in wardrobes, radiator and door to en-suite. Having low level WC, pedestal wash hand basin, tiled shower cubicle, tiled splashbacks, coving and radiator. Having double glazed windows to the front, radiator and coving. Having double glazed window to the side, built-in wardrobe, radiator and coving. Having panelled bath, pedestal wash hand basin, low level WC, tile effect flooring, part tiled walls, double glazed window to the side and coving. To the front there is a lawned garden with good sized driveway providing ample off road parking which leads to the front door and garage together with access to the side of the property. To the rear there is pretty tiered garden with patio patio and steps leading to the lawned garden.